Place Value – A place for everything and everything in its place. Numbers can be confusing without understanding place value. Sometimes a young child may think that “12” is equal to “3”. Unless a firm understanding of base ten is established, children can become lost and confused early on in their math journey. This is why Arithmetic Village introduces concrete visual base-ten from the beginning. 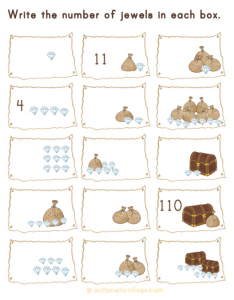 Ten jewels fit into a sack (no exceptions) and ten sacks fit into a treasure chest (no exceptions). This foundation will help with concepts like borrowing and grouping. Some people go straight to the tricks to help children quickly compute difficult math equations, but without this foundational base-ten knowledge, children might not understand what exactly they are figuring out. Some people point out that these concepts and Arithmetic Village seems too easy. I take that as a compliment. The concepts are easy if you understand them the first time. It’s the visuals that make the concepts easy to understand! I want children to believe it is easy, with their whole heart.